BOSTON – Sen. Edward M. Kennedy was mourned at a Boston church and laid to rest at Arlington National Cemetery Aug. 29, amid words of comfort from the Book of Wisdom, Paul’s Letter to the Romans and the Gospel of Matthew, and recollections of his life by his sons, his pastor, President Barack Obama and Cardinal Theodore E. McCarrick. 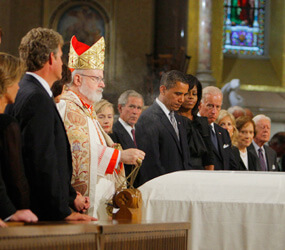 During the funeral Mass for the senator at Boston’s Basilica of Our Lady of Perpetual Help, Father Mark Hession, pastor of Our Lady of Victory Parish in Centerville, Mass., linked the Scripture readings – chosen by Kennedy, his wife, Vicki, and their family – with elements of the senator’s own life and faith. Boston Cardinal Sean P. O’Malley presided over the funeral and said the final prayers of commendation. Boston College chancellor Jesuit Father J. Donald Monan, a longtime friend, was the main celebrant. Four other priests concelebrated: Father Raymond Collins, pastor of the basilica, also known as the Mission Church, and the senator’s longtime friends Father Gerry Creedon, pastor of St. Charles Borromeo Church in Arlington, Va.; Father Percival D’Silva, pastor of Holy Redeemer Church in Kensington, Md. ; and Jesuit Father Donald MacMillan, chaplain at Boston College. A long list of family members participated by giving the readings and petitions, taking up offertory gifts or serving as pallbearers or ushers. Music was provided by cellist Yo-Yo Ma, the Tanglewood Festival Chorus, mezzo-soprano Susan Graham and tenor Placido Domingo. Kennedy’s two sons, Patrick and Ted Jr., offered remembrances at the end of the Mass. Each recalled lessons learned and strength gained from their father. Later, during the burial service at twilight at Arlington Cemetery in Virginia, Cardinal McCarrick, Washington’s retired archbishop, said Kennedy deserved his reputation as the lion of the Senate. “His roar and his zeal for what he believed made a difference in our nation’s life,” said Cardinal McCarrick. “Sometimes, we who were his friends and had affection for him would get mad at him when he roared at what we believed was the wrong side of an issue,” he continued, “but we always knew and were always touched by his passion for the underdog, for the rights of working people, for better education and for adequate health care for every American. “His legacy will surely place him among the dozen or so greats in the history of the Senate of the United States,” he said. Cardinal McCarrick also read excerpts of letters exchanged by Kennedy and Pope Benedict XVI in the last few weeks. Kennedy sent a personal letter to the pope that Obama delivered during their meeting at the Vatican in July. The Vatican responded a couple of weeks later, the cardinal said. Kennedy wrote to the pope: “I have been blessed to be a part of a wonderful family, and both of my parents, particularly my mother, kept our Catholic faith at the center of our lives. That gift of faith has sustained, nurtured and provided solace to me in the darkest hours. I know that I have been an imperfect human being, but with the help of my faith, I have tried to right my path. “I want you to know, Your Holiness, that in my nearly 50 years of elective office, I have done my best to champion the rights of the poor and open doors of economic opportunity,” he continued. “I’ve worked to welcome the immigrant, fight discrimination and expand access to health care and education. I have opposed the death penalty and fought to end war. Those are the issues that have motivated me and been the focus of my work as a United States senator,” he said. Cardinal McCarrick said that two weeks later, Kennedy received a reply. It read, in part: “The Holy Father … was saddened to know of your illness, and has asked me to assure you of his concern and his spiritual closeness. He is particularly grateful for your promise of prayers for him and for the needs of the universal church. “His Holiness prays that in the days ahead you may be sustained in faith and hope, and granted the precious grace of joyful surrender to the will of God our merciful father. He invokes upon you the consolation and peace promised by the risen Savior to all who share in his sufferings and trust in his promise of eternal life,” it said.